In the past weeks we have generally worked a lot on the deathmatch mode. We implemented a gfx gun pack from this unity asset Modern Weapons Pack by FNProduction to help our non-artistic programmers needs. In relation to implementing guns, we made a simple aim. When holding a gun, navigate using the right analog stick to aim the weapon between top and bottom in the way the character is facing. 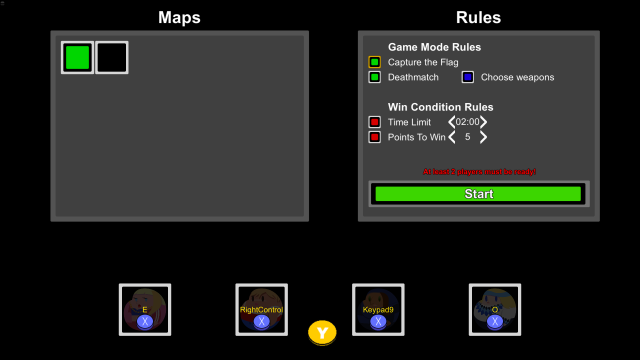 Since we now have two game modes and two different ways of playing them, point or time, we need to make a selection menu of sorts. We looked a inspiration from super smash brothers and our programmer came up with this, which you might have seen if you follow us on facebook or twitter. Use the left stick [on controller] to navigate and the "A" button to toggle any of the settings. If both capture the flag and deathmatch is on you will play combined or as we call it normal mode. In this mode you won't get points for shooting, but only delivering the intel. However if you have the flag, and get shot you will lose it. We are working on making a demo build including one level, a couple of guns and the three game modes. We are expecting it to be ready Friday December 15th - a week from now. Hope you guys are gonna give it a try and tell us what you think. More info will follow when the demo is live.